Orders ship in two boxes at a flat rate of $50. Due to the nature of this product, orders will take 3-4 days to ship. Cannot ship to P.O. boxes. 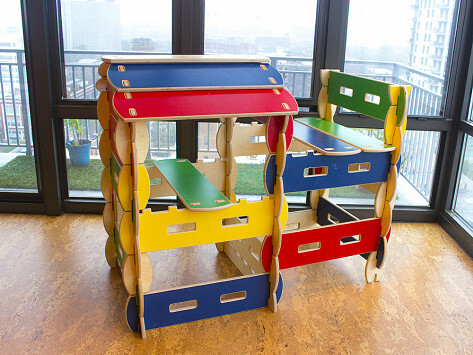 Bilderhoos 2.0 building sets are handcrafted in the U.S. of sustainable wood. They're easy for kids to assemble into life-sized forts, houses, stores, whatever their imaginations can think up. Made by a mom-owned business where her husband is the designer and her two sons assist in the creation. Best of all, Bilderhoos 2.0 can provide years of fun, indoors and out. Dimensions: Stacked/Stored: 32" x 22" x 10; Assembled (varies, minimum): 32" x 32" x 37"
When the Archer family saw the wooden play sets popular with children in Denmark, they knew they had to have one at home. Back in the Pacific Northwest, David Archer built a set for his own kids — and mom Jill saw a chance to build a business. Today Bilderhoos 2.0 is USA-made and mom-owned. Jill’s sons handcraft the notched boards out of sustainably sourced, marine-grade plywood. The notches make it easy for kids to fit the boards together; like Lincoln Logs but on a grander scale. No tools are needed. Imagination is all that’s required for building forts, playhouses, stores . . . the possibilities are endless. 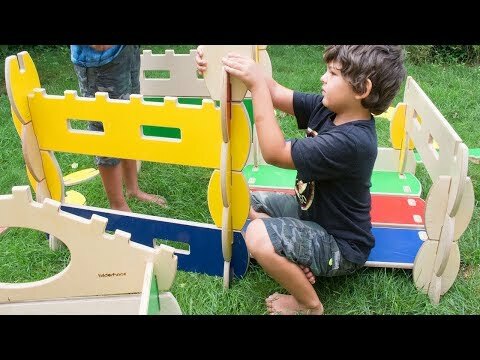 Easy enough for kids to assemble—and disassemble—themselves, Bilderhoos 2.0 are perfect for the yard, the garage, the basement, or the playroom. Anywhere you have the space, let the building begin. The thoughtfulness and craft in these sets is meticulous. Longer boards have a notch for easy carrying by little ones. Precision cutting makes for smooth edges. Non-toxic painted finishes safely add pops of color. Bilderhoos 2.0 make a great statement gift and are perfect for neighborhoods or schools to go in on together. Way to teach cooperation to everyone!